What can you do to help your pet cope with firework noise? Here are five ways to keep your dog calm during fireworks. We all know most dogs don’t enjoy fireworks as much as we humans do. Some lucky pet owners have dogs that are not bothered by the loud explosions fireworks produce, but the majority of us have a brave canine who courageously barks at the vacuum, chases squirrels, and scares off the unsuspected mailman or passing school children, but when fireworks start, that same menacing dog takes cover under the bed, sofa, any blanket, or if it is my dog, inside the bathtub. Today we celebrate New Year’s Eve, and come midnight most cities will have an amazing firework display that will send our pets running for cover. Put a Thunder Shirt or an Anxiety Wrap on your dog. If you don’t have one, don’t worry. You can use a smaller size t-shirt on your dog and this will create the same sensation. Place your dog in his safe place. If your pet is crate-trained placing him or her in the crate will be best. Make sure your pet’s safe place is away from windows. 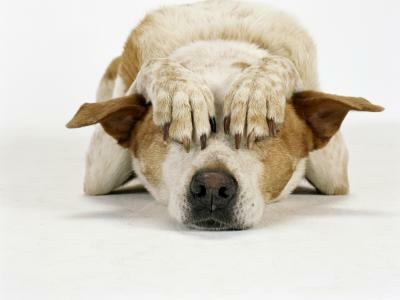 If you know your pet will go into panic mode once fireworks start, please do not leave them home alone or in the dark. Play some relaxing music or white noise. Having a pleasant sound to drown out firework noise will help your pet remain calm. Distract your pet. Give Fido a bone to chew on or play a game with him. As a last resort, speak with your veterinarian so that a professional can administer something to help your dog deal with fireworks. This is only if your pet requires medical help. Pets are family members and like us humans, they too want to be near someone when facing scary situations.